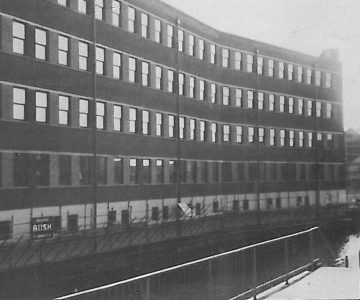 Drayton Windows were subcontractors for R G Carter Limited at Anglia Television, Norwich. The word ‘Aluminium’ has been omitted from the title of Drayton Windows, in view of the fact that Timber and UPVC, as well as Aluminium, Double Glazed Windows and Doors are now included in the comprehensive range of products supplied for both the commercial and domestic market. 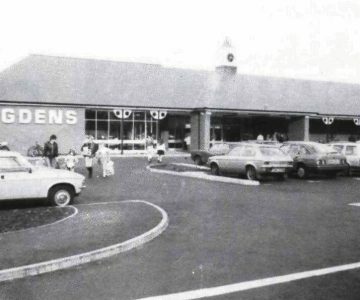 Drayton Windows met its target of 40 weeks for the completion of the new 3,350 square metres superstore for Bugdens at Blue Boar Lane, Sprowston Norwich, which was opened officially on 16th October by Anglia Television broadcaster, Patrick Anthony. 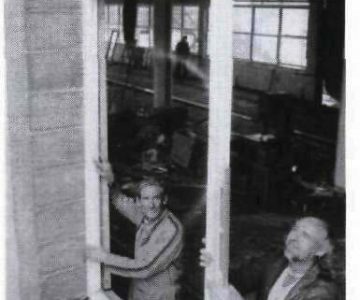 1985 saw a 50% increase in sales on that of 1984. Business is already being secured in Norfolk & Suffolk where architects are increasingly nominating Drayton Windows as sub-contractors. 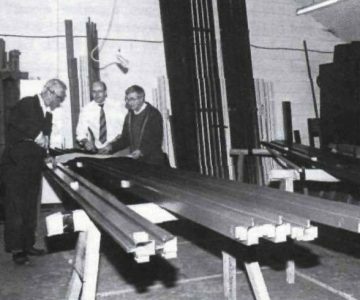 Image right: Peter Griffin (Left) and Geoffrey Walton, working on Kawneer Aluminium windows and door systems fabricated and installed by Drayton Windows at the new factory for Signal Processors in the Cambridge Science Park. The new 20,000 square feet production unit for Datron Instruments, designed by R G Carter Projects, with double glazed aluminium windows, supplied and installed by Drayton Windows. Drayton Windows extended the product range to include curved windows & doors, patent glazing, barrel vaults, revolving doors and glass walled commercial extensions. This is in addition to the aluminium, UPVC and timber framed architectural and domestic window systems on which Drayton Windows have built their fine reputation during the past few years. 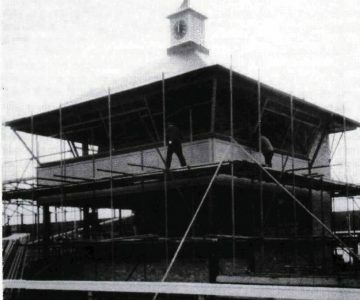 Image right: The new Commentary and Presidents Box at The Royal Norfolk Showground, Norwich. 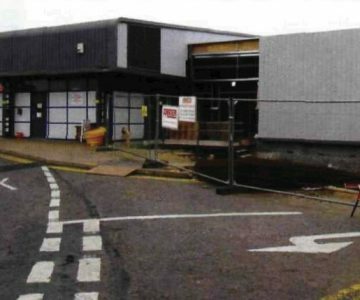 Drayton Windows were involved in R G Carter Drayton’s project for the New purpose built 124 feet long Jaguar Car Showroom with offices, specialist workshops and staff facilities on Cromer Road, Norwich. 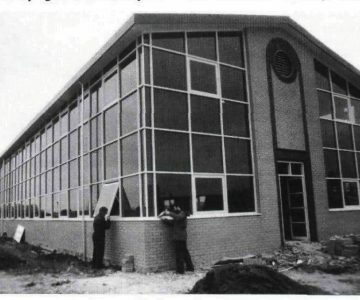 The new showroom was steel framed, with brick and metal cladding, but mainly glass walls on three sides, supplied and installed by Drayton Windows. 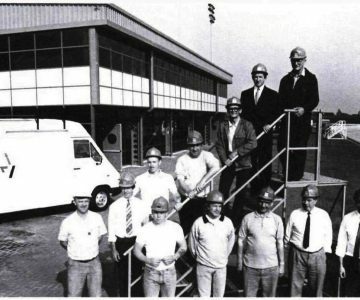 Image left: Members of the RGC Drayton Team who completed the new Jaguar House Showroom complex for Mann Egerton in only 17 weeks. The outlook for the future of Drayton Windows is one of optimism with many orders received for mono finish windows. 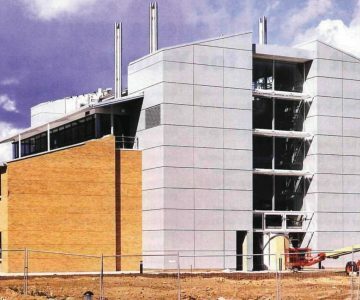 One being black finish windows for Thurston School, Near Bury St Edmunds and orders for white finish windows at the Medical Research Council, Cambridge. 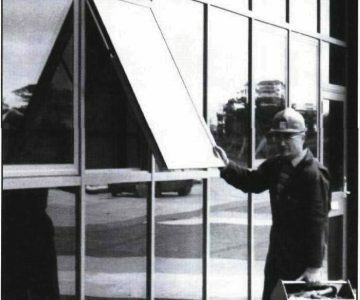 Image right: Peter Warnes (left) and Ronnie Hoy seen installing Drayton Windows at Sussex House for the Norwich Union Insurance Group. As well as securing Group work, external orders are also on the increase and fixing gangs have been in action throughout the region. 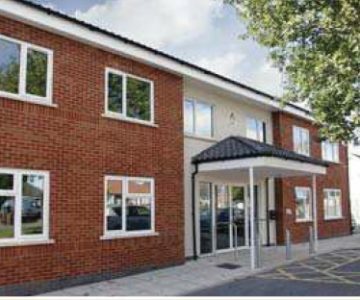 Drayton Windows also gained their first order for thermally-broken, vertical sliding windows, which allows each sash to be turned inwards for easy inside cleaning, at an office development in Newmarket Road, Cambridge. Image left: John Lofty (left) and Gary Wright, fitting windows in a special shade of blue at Halfords new retail store and service centre in Barker Street, Norwich. Shotley Point Marina has been the location for the fixing of external curtain walling. On the product front, one of the branches main suppliers, Kawneer (UK) Limited, has revised and upgraded its tilt and turn windows, which are now rod operated as apposed to the previous cable system. 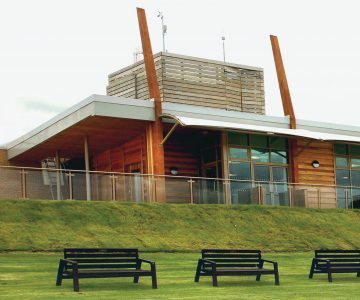 Image right: The administration building at Shotley Point Marina, featuring external curtain walling by Drayton Windows. 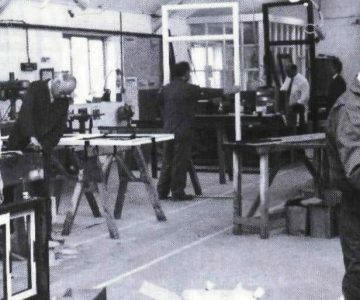 Drayton Windows were securing contracts throughout the country, travelling as far away as Exeter, where units at the Sowton Industrial Estate have been fitted with doors, frames and windows. Image left: Curtain Walling for the new library extension at Norwich City College, being fabricated in the workshop at Drayton Windows. From left to right – Mike Dack (Fabricator), Rodney Bunn) Senior Estimator/Surveyor) and Peter Griffin (Shop Foreman). Drayton Windows have taken off from Norwich Airport having designed, supplied and installed triple glazed curtain walling, in red and blue finishes, for a new 525m2 extension, constructed by R G Carter Drayton, to the Airport’s passenger terminal. The project included the provision of a specially extruded aluminium section for sound proofing purposes. 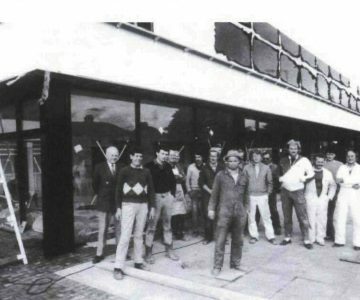 Image right: In front of the new extension to Norwich Airport’s passenger terminal, which is enveloped in Curtain walling are: Site Agent David Whitehead (extreme left), team from Drayton Windows from left to right: (back row) Draughtsman Tony Green; Foreman Fixer Brian Dunthorne; Fabricators/Fixers Barry Low and Jimmy Smith; Manager Martyn Gibson and Works Foreman Peter Griffin with (front row) Fabricators/Fixers Jeff Lambert; Colin Matthews; Mike Dack; Contracts Manager Alan Wright and Senior Estimator/Surveyor Rodney Bunn. 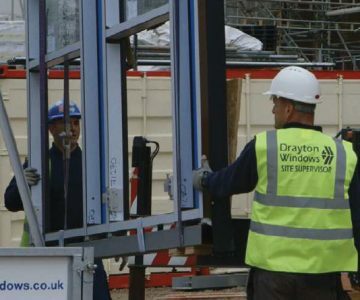 Drayton Windows experienced high demand for the fabrication, supply and fixing of their range of Aluminium Products. Image left: Fabrication David Ellis (Standing) and George Hendry of Drayton Windows with aluminium louvre units in a bronze finish for the new offices of South Norfolk District Council. During a period where many of our competitors were struggling to secure projects, Drayton Windows were able to report a full order book. Senior Estimator/Surveyor Rodney Bunn said “We have been very fortunate in winning a large number of contracts in spite of the recession and we are on target to meet out forecast for the end of the year”. Image right: Drayton Windows Foreman Peter Griffin at work on the Aylsham Business Park. 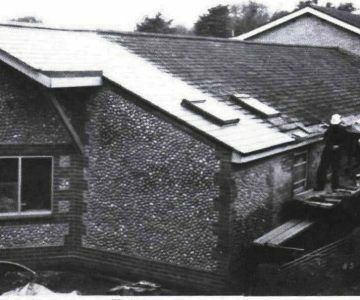 Drayton Windows and Youngs Doors supplied the windows and doors to the Doctors Surgery at Holt, Norfolk which was constructed by H Bullen & Son. Health service patients need no longer catch a chill and some British Soldiers are now free from the draught thanks to Drayton Windows. Purpose built windows in the new Bertram Diabetics unit at West Norwich Hospital, and doors and windows installed in the renal dialysis unit extension to the Broomfield Hospital, Colchester, to help keep out the draughts as patients receive their treatment. 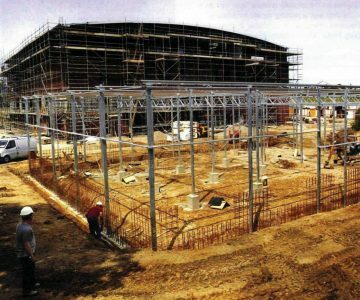 Keeping the weather out was also the prime reason for supplying 120 Kawneer Designer 53 Door systems to Colchester Barracks. Image right: Its all go in Drayton Windows workshop who have been helping a wide range of customers. 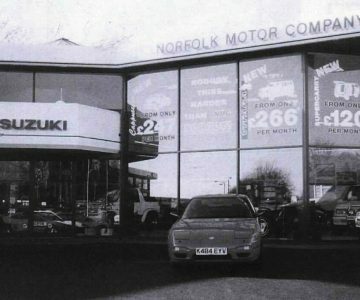 One of the most up to date and futuristic looking car showrooms opened in Norwich, built by a Group of local Carter Companies led by main contractor John Youngs. 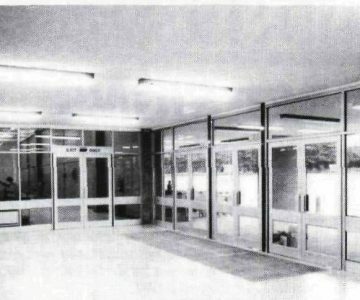 Image left: The impressive glass display areas were made by Drayton Windows. Drayton Windows installed curtain walling to the terminal building at Norwich Airport. 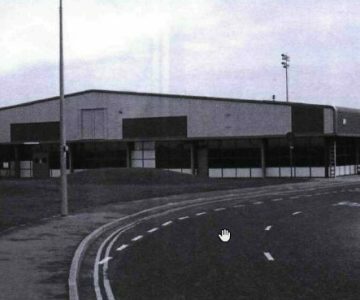 R G Carter Drayton were contracted by Norwich Airport Limited to raise the roof to the terminal building. 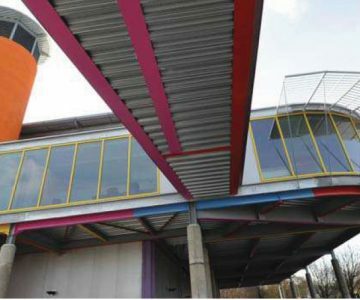 Both east & west wings were extended by one level to provide office accommodation for the airport management and KLM Helicopters. 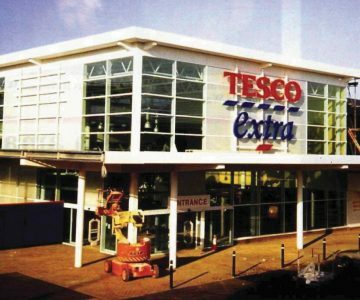 Drayton Windows supplied Curtain Walling for the new Tesco Store, Pitsea, constructed by R G Carter Projects. Drayton Windows have played a key part in the restoration and modernisation of Castle House, a principal building in the centre of Norwich. 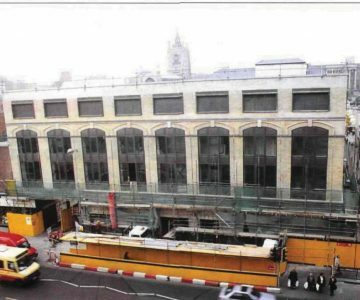 Works to fabricate, supply and install windows and curtain walling were completed on time in just three months, despite the constraints of the congested City Centre. Image right: Castle House in Norwich which has benefited from the skills of Drayton Windows. Drayton Windows supplied Curtain Walling, entrance doors and shaped Louvre’s for the six-acre Bannatyne Project as well as window frames. 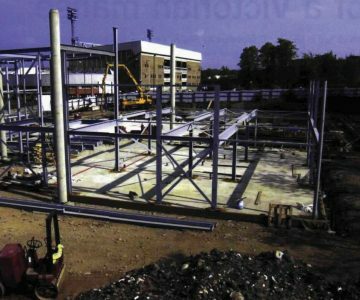 Its was Operations Manager, Tim Ridgewell’s job to measure all the openings on the building to the nearest millimetre, when it was little more than a steel skeleton on a muddy construction site! The new look order book was a result of investment in new technology. 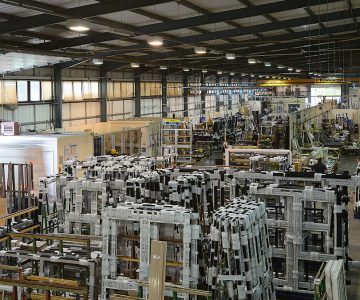 As one of the largest approved dealers of Kawneer Aluminium extrusions in East Anglia, Drayton Windows adopted its suppliers own Kalucad design system. Its software is unique and available only to its dealers. Information is taken from architects drawings and input into the system to produce drawings of window and Curtain Wall requirements. This process marginally saves on the time it takes to prepare drawings manually, but Kalucad simultaneously produces the cutting schedule, halving the pre-production time. 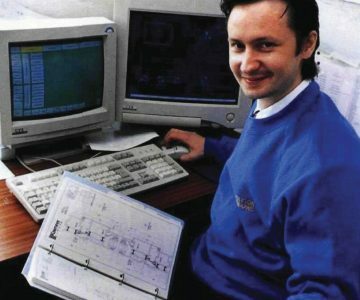 Image right: CAD operator Lee Campling shows off Drayton Windows new system in 1999 and 20 years later Lee is the Drawing Office Manager today. 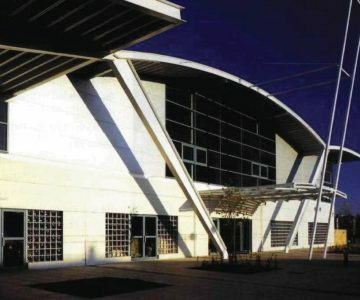 The Bio-science Centre is the first of its type in Europe. Its units are designed for emerging businesses engaged in life sciences research and development. A central feature of the building is a 17-metre atrium, linked by seven bridges. A foundation stone was laid by HRH the Duke of Edinburgh on February 2, a measure of the architectural merit of the building and recognition of the importance of the work that will be carried out. Drayton Windows has supplied and fitted the Curtain Walling at both ends of the atrium. They feature massive 2.5 square-metre sealed and laminated glass units, each weighing about seven hundredweight. The installation was a major feat of engineering and skill. Drayton Windows have been contracted to install the Curtain Walling at the new Swimming Pool, Riverside Norwich, constructed by R G Carter Drayton. Drayton Windows supplied Curtain Walling and windows to the Norwich Legal Firm Mills & Reeve, who will occupy one of the prestigious office buildings on Whitefriars, Norwich. Norwich Union building on Broadland Business Park, East side of Norwich, has a new restaurant for staff to enjoy. Built by R G Carter Drayton, features included elevations of glass Curtain Walling supplied by Drayton Windows and Western Red Cedar Rain Cladding as well as a raised and south-facing terrace. Drayton Windows moved from the Low Road, Drayton to Horizon House. Drayton Windows carried out more works at Norwich Airport for an extended baggage handling centre and improved terminal facilities as part of a five year programme to accommodate forecast growth in passenger numbers. Design innovations by CDG for works at RAF Cottesmore to refit and extend a military aircraft hangar and the new-build of a neighbouring support facility. Among the design features is, in effect, triple-glazing specially made by Drayton Windows. The glazing exceeds the demands of the building regulations, creating a quiet and comfortable place of work. 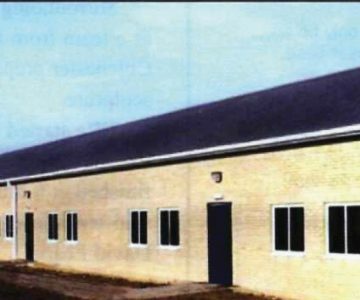 Image right: The support facility building at RAF Cottesmore that is packed with sound deadening features. 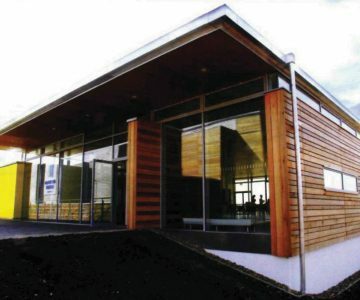 Drayton Windows was one of many Group companies to be involved at Lincolnshire’s Epic Centre. Drayton Windows supplies Curtain Walling, which dramatically covers 90% of the extension for sheet music business Music Sales. 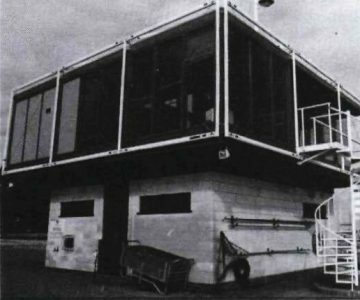 The building stands on stilts, forming an undercroft car park at the company’s Bury St Edmunds Warehouse which was constructed by R G Carter Thetford. Specially made blast-resistant windows are to feature in a new Norwich Police Station. Blackburns began construction in September, demolishing an old police station, a police house and three adjoining properties on the City’s Earlham Road to make way for the 600 square metre, two story building. 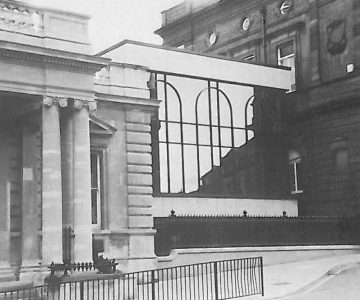 The protective windows and Curtain Walling for the buildings entrance and a six-foot square frameless window for the first floor, were made by Drayton Windows. Drayton Windows installed Curtain Walling, windows & doors at Premier Inn Richmond. 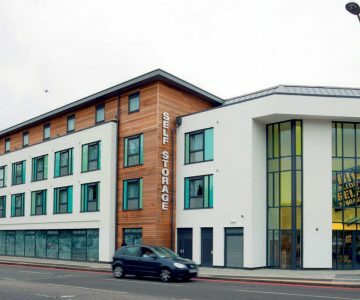 The hotel was constructed by R G Carter Projects on the Big Yellow-led project to construct a brand new 92 bed hotel, which is being leased from the storage company for 25 years. The successful completion of the new Humanities Building for the University of Cambridge would not have been possible without the Drayton Windows team. Curtain Walling, windows and doors were designed, supplied and installed by the team for the entire project. As the project was on a tight schedule, Drayton Windows took the early decision to order materials in first and utilise the four week procurement period to complete the design drawings. 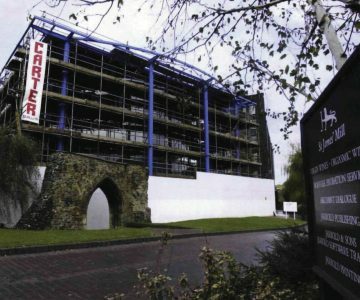 This decision gained valuable time which was needed for the fabrication of the Curtain Wall and windows. Over 15 people played an important role in the in-house production of the windows and Curtain Walling. 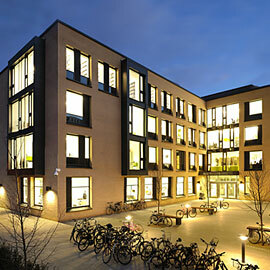 The new building was completed on time and was handed over to the University of Cambridge to much acclaim. 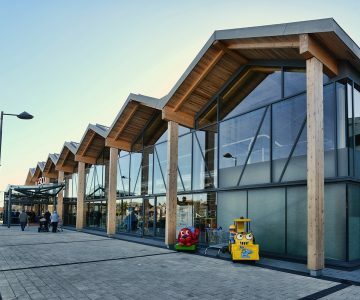 Drayton Windows provided a value engineered solution for the stores entrance including Curtain Walling and doors. This is now the 43rd Tesco Project that Drayton Windows have collaborated on with R G Carter. Drayton Windows manufactured 480 window cassettes designing a bespoke unitised system for the refurbishment works at Norfolk County Hall. 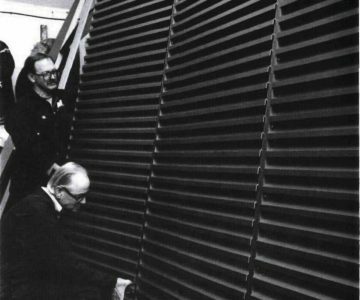 A template of the openings was created in our factory to facilitate the off-site manufacture of the pods. 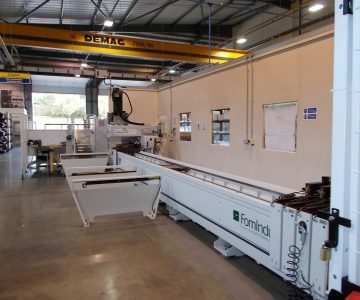 Drayton Windows invested in a new Multihead CNC Machine. (Computer Numerical Control). (Multihead Cassette containing 12 different tools allowing pre-programmed prep’s to be completed on 5 Axis). 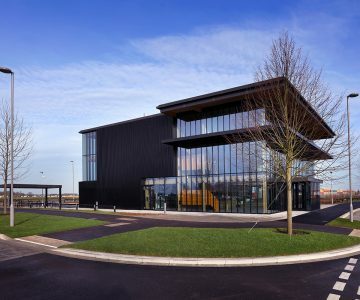 Drayton Windows completed the glazing works at Alconbury Weald. 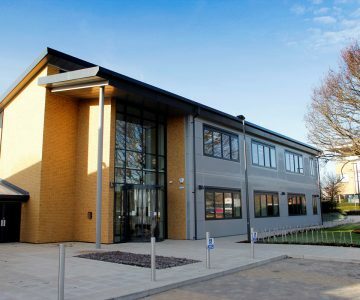 This is the second successful project Drayton Windows has completed on the site, the first being The Incubator Building back in 2014. Drayton Windows installed the windows, which are flush with the cladding, to give a sleek and modern finish to the exterior to the new R G Carter Chlemsford Office. 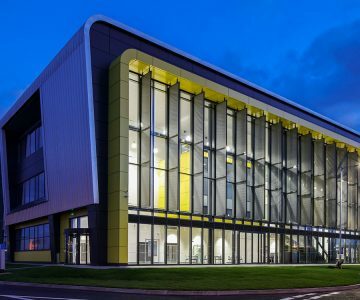 Drayton Windows were proud to be a part of the AIRC Cranfield Project, which won a LABC Award for Best Commercial Project. Click here for more details on the project. 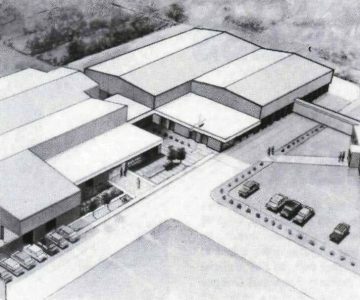 Image left: Cranfield Aerospace Facility.